As an eighth-generation native of the Santa Clara Valley, Jeff has seen the area grow and change. He’s very pleased to have played a part in shaping the Valley, protecting and wisely using the natural resources here. 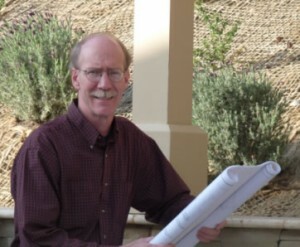 He considers it especially vital to manage and use water responsibly, and his commitment to good design, maintenance, and common sense led him to become certified as a Landscape Irrigation Auditor. Jeff opened his Saratoga practice in 1979, soon after graduating from Oregon State University’s Landscape Architecture program. Since then his primary goal has been to approach each project both uniquely and passionately, providing personal attention to every client. Over the years he’s been involved in over 1500 residential designs, as well as multi-family and townhome developments, planned unit developments, commercial and industrial projects, neighborhood parks, and church and school grounds.